It's the second day of testimony at hearings for the inquiry into missing and murdered Indigenous women and girls in Iqaluit. Follow along in our live blog. Good morning. We are just getting underway at the Frobisher Inn in Iqaluit for day 2 of the hearings. 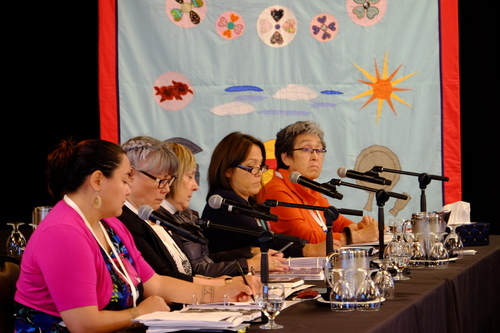 Today, we're expecting the conclusion of the Inuit perspectives panel that started yesterday, followed by the start of a second panel, this one on Indigenous health and well-being. Commissioner Michele Audette has joined us today (on screen). "Thank you to my fellow commissioners for letting me be a mom... this is what they mean by work-life balance," she says to the room in French. After introductions and an opening statement from commissioner Audette, a 5 minute break is called for. Cross examination will begin when the hearing resumes. A recap of how these hearings are structured: Three panels are scheduled to testify this week. 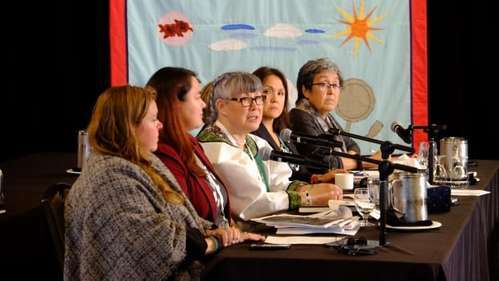 The panel will give their testimony, followed by cross examination by "parties with standing," defined on the MMIWG website as "persons or groups who have demonstrated that they have a substantial and direct interest in the subject matter of the National Inquiry." There are 10 such groups here this week, most represented by legal counsel. Following the cross-examination, commissioners will ask questions of the panellists directly. 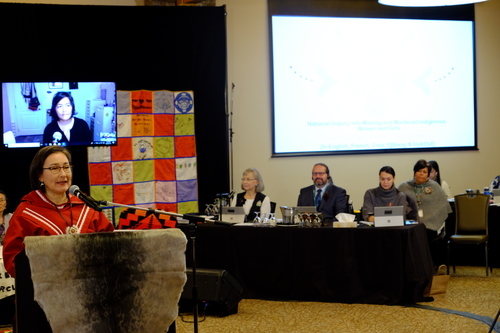 Yesterday, we heard the testimony and the beginning of cross examination for the first panel of the week, focused on the Inuit experience. Their cross examination and questioning by commissioners is scheduled to conclude this morning, and the second panel will begin this afternoon. Read below for my recap of what we heard on day one. 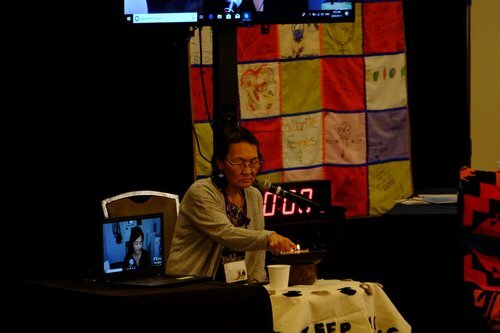 CBCInuit life, culture and healing dominated discussion on the first day of hearings in Iqaluit for the federal inquiry into missing and murdered Indigenous women and girls, as a trio of panellists outlined the impacts of colonialism and efforts to regain lost culture. We are back. Beth Symes is beginning today's cross examination, representing Pauktuutit Inuit Women of Canada. "I've been in Iqaluit for 20 years," Symes begins. "In 20 years, this place has been transformed." Symes says she is going to focus her questions on the QTC reports, and on housing. Symes highlights that in the 1950s, Inuit in the region lived in over 100 small settlements. By 1975, they lived in just 13 communities. "In just 25 years, this is a radical transformation," she said. Elisapi Davidee Aningmiuq, Hagar Idlout-Sudlovenick, and Inukshuk Aksalnik are all back for today's cross-examination, accompanied by legal counsel. Symes runs down the factors that led Canada to relocate Inuit into communities as Idlout-Sudlovenick and Aksalnik agree. Asserting sovereignty in the high Arctic, administrative efficiency by centralizing services into communities. 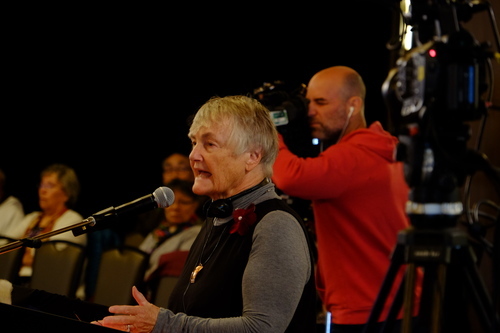 In a similar line of questioning, Symes outlines what Inuit were promised by the government to relocate. Education, health care, housing (in some cases, free or low cost housing). "Is there anything in writing?" Symes asks. "We have never seen that," says Idlout-Sudlovenick. Symes then highlights that in the QTC reports, there were over 20 reports about the promise of housing. Nobody has ever denied that the promise was made to the QTC, the panellists say. Symes then runs down what was done by the government to compel people who didn't want to move, including withholding their family allowance. Idlout-Sudlovenick says this is more well-known for Inuit who refused to send their children to school, remembering seeing her parents threatened in a similar way when her siblings were picked up. Symes then zeros in on the lack of housing provided. "Is it fair to say that there was not enough housing, or in some cases no housing provided?" She asks. Idlout-Sudlovenick: "Starting in the 50s and 60s, there was very little housing provided. In the 60s and 70s, there was more housing provided. But at the start there was very little and in some cases no housing provided for some families." Idlout-Sudlovenick elaborates that the houses provided were of poor quality, calling some of them "matchbox" houses. In some cases, multiple families shared a 288 square foot house that was not properly built for the Arctic. The line of questioning now turns to Canada's responsibility for housing today. Symes points out that as of 2016, Nunavut's population has grown by 22 per cent over a decade. She asks if the rate of housing has kept up with the growth. Idlout-Sudlovenick: "no." 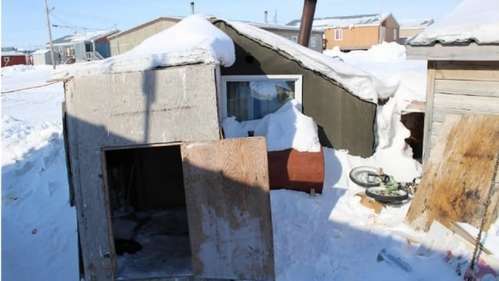 "What is the state of housing in Nunavut?" Symes asks. "Generally, it would be overcrowding," says Idlout-Sudlovenick. "Because of overcrowding, wear and tear is typically much higher." CBCThe $240 million for Nunavut translates to about 48 new homes per year, says the president of the housing corporation. Symes: "Do you agree there is a housing crisis in Nunavut?" Symes references the $24 million a year allocated by the housing corporation, saying that by her math, it adds up to about 18 new units a year. That number is below what the Nunavut Housing Corporation President told CBC - he said 48. "Would this address the gap?" She asks. "It would take a long time," says Idlout-Sudlovenick. A five minute recess is abruptly called for. I don't have a great view but I'm not certain what happened. Counsel for the commission is gathered in the corner of the room discussing something. Counsel has broken up their huddle. It appears the break was due to some sort of procedural issue that has been sorted out. Symes has returned to the podium and is continuing her questioning. Symes now asks about women and families fleeing violence, noting they can become homeless. "Are there immediate places for her to go with her children?" She asks. "There are very limited options," says Idlout-Sudlovenick. Symes then notes the negative impacts of overcrowding on physical health - noting the resurgence in TB in the territory - and mental health. She then asks if it has an impact on suicide. The clock is stopped and counsel takes the microphone, asking Symes to keep her questions to the information and topics provided by the witnesses. "At this point, you are sometimes asking them to speculate," Symes is told. "With respect, I don't agree," says Symes, saying that these are "very sophisticated witnesses" and contending that all of her questions are based out of the QTC's reports. Chief Commissioner Buller weighs in, reminding Symes that if a witness is asked to speculate, their testimony is of little value in the commission's fact-finding. "I understand your strategy in your cross examination," says Buller. "But when a witness has to speculate, their testimony has little probative value." Symes continues, asking if overcrowding is a risk factor to family violence. Idlout-Sudlovenick agrees. "What's the way forward for Nunavut, in terms of housing?" She asks. Speaking for QIA, Idlout-Sudlovenick says that the group advocates for Inuit on their region for housing. They also work with both federal and territorial governments "to make sure they're doing their best to meet the needs of Inuit in the Qikiqtani region." "I have no doubt that you're a fabulous advocate and QIA is a powerful voice in these issues," Symes says. "But why is the progress so slow with respect to this undisputed need?" Idlout-Sudlovenick says it comes down to a lack of money. "There is some progress, but it's going to take time." "How long did you work in housing?" Symes asks. "10 years," Idlout-Sudlovenick answers. Symes turns to Aksalnik. Yesterday, she called for the RCMP to examine its own history with respect to Inuit. Why would she want that when the RCMP delivered an inadequate report on the sled dog slaughter, she wonders? Why not an independent investigation? "I don't know," says Aksalnik, chuckling. Symes turns to Davidee Aningmiuq. Her next questions will be based on her work on cultural revitalization, she says. She asks Davidee Aningmiuq for an estimate on how much of her executive director's time is spent chasing funding. "The majority of his time," she answers. "Sometimes, are you trying to fit your programs into somebody else's [the funder's] box?" She asks. "Yes, that has happened." Symes establishes there are several programs across Nunavut providing cultural programming. She asks if one of the issues is these all programs are all reaching for the same funding pot? "True," says Davidee Aningmiuq. Symes asks if the elders running Davidee Aningmiuk's program are paid - they are - and if they would volunteer their time. "Elders have volunteered their time enough," she says. "So it’s high time that we honour them.” The elders also rely on these wages to live, the pair establish. Davidee Aningmiuk is then asked about the cost of materials for her kamik making program. She speaks about the amount of work it takes to prepare the materials for the program. "You think the cost is high, but it doesn't reflect the work that goes in," she says.